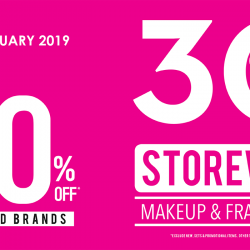 7 - 14 Feb 2019 Sasa: Storewide 30% OFF Makeup & Fragrances + PWP 50% Off Exclusive Brands! Need to grab some last-minute Chinese New Year beauty products for house visiting? Sasa got you covered! Enjoy 30% Off ALL Makeup & Fragrances in-stores, with 100 brands to get spoilt for choice.A little bonus discount with PWP 50% Off on over 40 Exclusive Brands. You know you can’t miss this sale! Limited time only! 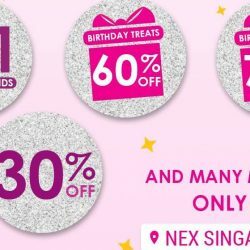 Sasa Singapore: Buy 1 Get 1 FREE Selected Brands, Birthday Treats Up to 70% OFF, 30% OFF & Many More at NEX & Jurong Point! HAPPY BIRTHDAY SASA NEX AND SASA JURONG POINT!!! Join the party at SASA @ Nex and Jurong Point on their 8th and 15th birthday respectively! To celebrate, there will be all these GREAT DEALS to enjoy! There are more deals to look for in store, so make your way down to these two outlets to enjoy deals you won't find anywhere else. While stocks last! 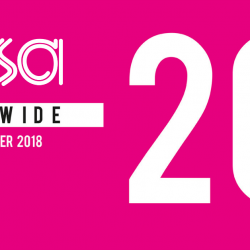 23 – 26 Oct 2018 Sasa: End October with 20% OFF Storewide at All Sasa Stores! End October with irresistible Storewide 20% OFF at Sasa! With an overwhelming 300+ brands in store, SAVE MORE with payday coming! From exclusive brands such as Eleanor, Soo Beaute, GOSH, theBalm to local favourites. Head down to your nearest SASA store now! 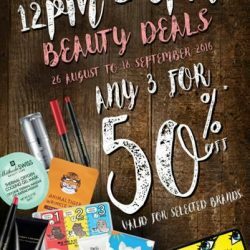 16 - 17 Oct 2018 Sasa Singapore: Get 2nd Item at just $5 from Over 40 Exclusive Beauty Brands! 2nd pc @ just $5 at Sasa! 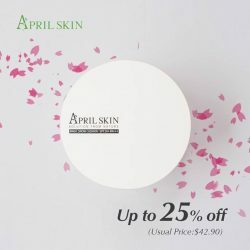 Say yes to over 40+ exclusive beauty brands including BRTC, Cyber Colors, Dr. G, Neogence, Sasatinnie, the Balm and more! Available at all SASA Stores till 17 Oct only. Chiong ah! 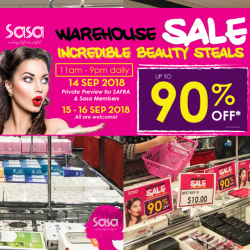 The highly anticipated SASA WAREHOUSE SALE is FINALLY happening this weekend! Only once a year you’ll be able to enjoy INCREDIBLE BEAUTY STEALS up to 90% discount! 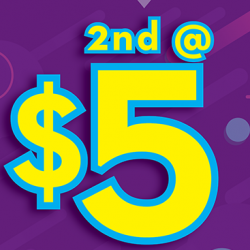 PLUS, did you know that if you spend above $38, you’re entitled to a $5 RETURN VOUCHER! Are you excited yet? Sasa Beauty Fair is coming your way to you from now till 1 Oct 2017 at Causeway Point. 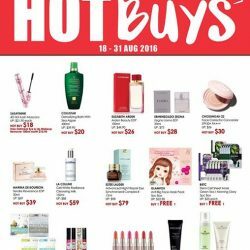 Not only you can get all your favourite beauty buys at fabulous steal at up to 70% off but also loots from as low as $1! 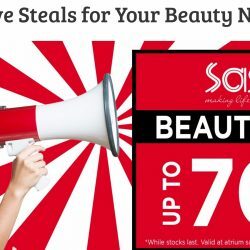 7 Sep 2017 Sasa: 1-Day Private Pink Sale with Up to 70% OFF Storewide & Prices As Low As $2! ARE YOU READY FOR SASA 1-DAY PRIVATE PINK SALE? Happening today for 1 day only, members you're in for a treat! Enjoy up to 70% off storewide with prices as low as $2, free gift and vouchers with purchases and more! PLUS, specially for Hougang Mall, Jurong Point Shopping Centre & Waterway Point only: Shoppers get to GRAB A CHANCE when they spend $50 or more. Limited prizes available only. Stand to win vouchers, products, points & more! Sasa Members, the Wait Is Almost Over. Your Supersize Rewards is finally back due to popular demand! Be spoilt for choice in exchange of your points.For 2 days only, members get to shop to their heart’s content at ALL STORES with up to 80% storewide savings*,plus up to additional $9 off* on top of prevailing promotion with your points. 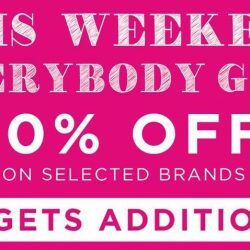 Till 21 Aug 2017 Sasa: Enjoy 20% OFF Storewide This Weekend At All Stores! 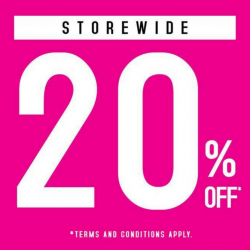 Kickstart your weekend with STOREWIDE 20% OFF* at Sasa. Happening from today till Monday 21 Aug, this is a sale that you’ll not want to miss! Too busy? 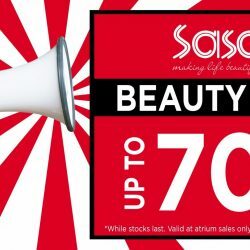 Shop on Sasa Qoo10 for online exclusive deals and enjoy up to 70% off & more! 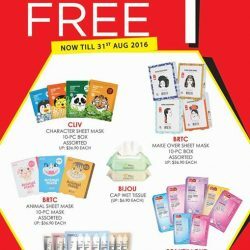 Till 9 Jul 2017 Sasa: Beauty Fair with Up to 70% OFF + Buy 1 Get 1 FREE + FREE Skin Analysis! 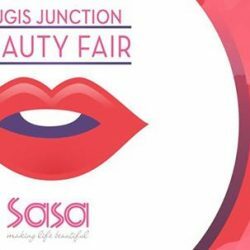 Sasa Beauty Fair is coming your way to you from now till 9 July at Westgate. 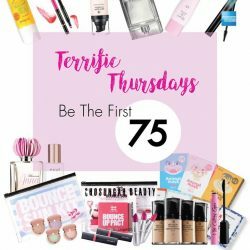 Not only you can get all your favourite beauty buys at fabulous steals at up to 70% off plus Buy 1 FREE 1 (and even Buy 1 FREE 2!) but you also get to EXPERIENCE Skin Analysis for FREE! Till 12 Mar 2017 Sasa: Everybody Enjoy 20% OFF This Weekend & Members Get Additional 10% + 5% OFF! Don't tell their bosses but Sasa is giving EVERYBODY 20% OFF this weekend! Plus members, you'll get additional 10%* + 5%* off! Here's more reason for you to shop to your heart's content. The long awaited 1-DAY PRIVATE PINK SALE is back next week! No joke, your #PinkThursday just got real. Members, shop your heart away this private sale in selected stores on Thursday 2 February 2017 & expect up to 80% off STOREWIDE, free goodie bags, vouchers, price as low as $2 & more*! Not a member? Visit any Sasa store now to join as one or simply flash the following Card or App at entrance to enter: DBS/POSB, Grab & HubTreats. Till 28 Nov 2016 Sasa: Black Friday + Cyber Monday Online Sale Up to 60% OFF + Additional 10% Cart Coupon! If you miss Sasa's 1-Day Private Sale on 24 November, you can still shop at their online store with their Black Friday + Cyber Monday Sale! 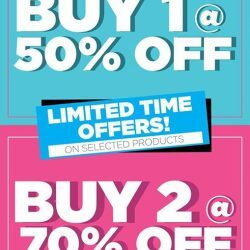 Enjoy up to 60% off + grab their 10% cart coupon on beauty brands such as Dr.G, Cyber Colors, Chosungah22, Gosh, BRTC, Sasatinnie and more! Free shipping for orders above $50. Sasa members, dun miss the private sale today just for you! Who needs BLACK FRIDAY when we have PINK THURSDAY? Only for today, Sasa will be closed for public and only open to MEMBERS only at Sasa Bugis Junction, nex Singapore & Lot One Shopper's Mall! Happening tomorrow: The long awaited Terrific Thursday with American Express® is finally approaching! 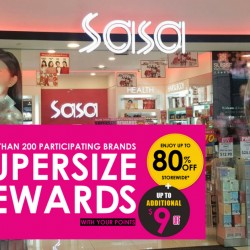 Calling out to all Punggollians~ We have a special lunch promo for you from now till 18 Sept.
Come down to Sasa Waterway Point and spoil yourself with makeup, skin care, fragrance, haircare and more! 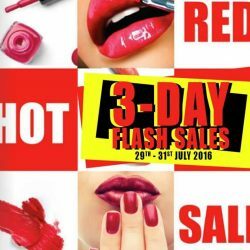 Get fantastic beauty deals at 50% off selected brands, from 12pm to 3pm! Terms & conditions may apply. [Exclusively at Sasa] If you haven't tried Chosungah22 Flavourful Lipsticks yet, you are missing out a lot. 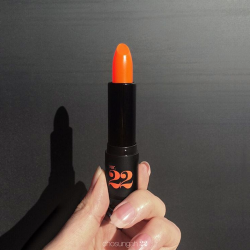 With vibrant colours, Chosungah22 Flavourful Lipsticks is definitely the to-go-for if you want to amp up your beautiful smile. Some thinks we are kidding, but we are actually not. If you have not, come on down to our store & grab your beauty loots with up to 70% off*! Participating brands include: Cyber Colors, Suisse Programme, Haruhada & Methode Swiss. Why smell good when you can incredibly great everyday with us? Yes, that's right! We are offering you attractive and alluring fragrances at a steal now. Get yours now, before they're all gone! Members, #DoubleUp & Earn 2X Reward Points from today till 16 June 2016. You've got it right. 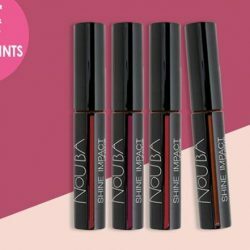 For only 1 week, you will earn 2X* your reward points when you buy any NOUBA Shine Impact Lip Lacquer at $30 (UP: $39.90). *Valid with above mentioned promo only. Get all your best beauty steals from Sasa Beauty Fair, happening at Bugis Junction Atrium from now till 29th May 2016. & That's not all. Earn yourself a complimentary tote bag with any purchase of $15 or more. While stocks last. 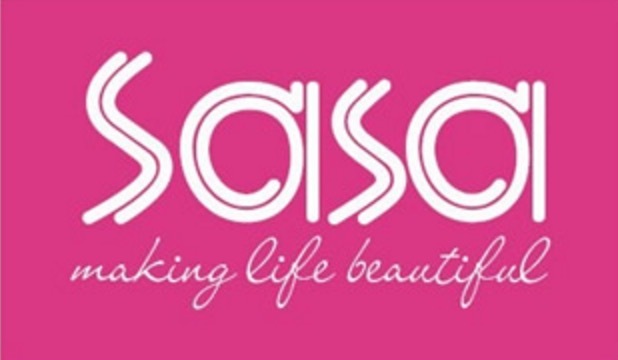 With a store in almost all major shopping centres, Sa Sa is a beauty and skincare store you can't miss! It carries brands mostly from Asia Pacific including Cyber Colours and many Korean brands. They have weekly promotions so that you will be tempted every time you step into the stores! The types of face masks they have are so mind-boggling that you don't know which one to choose. Their beauty advisors are quite helpful so just approach them for help.Stay updated on their weekly promotions here!